Blood-SP was specifically formulated for those with ITP based on our doctors' knowledge and their personal experiences on traditional use of herbs. 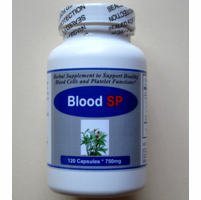 Blood-SP represents latest and best herbal combination to support people with low platelet counts. Selected herbal ingredients in Blood-SP play a vital role in assisting the body's natural mechanisms to promote healthy blood coagulation and reduce excessive bleeding due to various causes. Proprietary blend: Rehmannia glutinosa, Chlidanthus fragans, Radix sanguisorbae, Biota orientalis. Suggested Usage: As a dietary supplement, take 2 capsules each time, two times a day, or as suggested by a healthcare provider. In October, 2012 my platelet count had suddenly gone down to 3.000 from a previously normal count of 200.000. I was hospitalized and treated with IV Ig. and a very high dosage of Prednisone. After that I was given Rituxan infusions. Promacta and N-Plate in an attempt to get me off the 60 to 120 mg. of Prednisone I was on for four months. All of this lowered my platelet count even more. Even platelet infusions became ineffective. I was getting severe side effects from the Prednisone and my doctors didn't know what to do other than remove my spleen. I was desperate for help when found your website. It has been just one year since I started taking your natural herbs for my Refractory ITP on a daily basis. My doctors were against my taking them but when everything they tried not only failed to help hut made me worse. I continued taking them. Just as your product information stated. my platelets gradually increased. My last blood test showed a platelet count of 58.000, a safe range. and now all my other blood counts are back to normal. I am feeling healthier each day as all the drug side effects wear off. MN, local Hematologist is amazed at my progress and asked for the information about your company which I am giving him. He stated he may recommend your ITP & Platelet herbs to other patients. Thank you for your wonderful product. Sincerely. Susan R.
Our philosophy is to look at ITP (both Immune and Idiopathic Thrombocytopenic Purpura) as a whole body imbalance. Our goals are to improve the immune function, platelet quality and endothelial integrity in order to prevent and stop excessive bleeding symptoms. Our herbs can rebalance the body allowing its own mechanisms to restructure and heal the body from destroying platelets. This specialized formula was first developed 30 years ago due to a lack of adequate and effective treatments available in Western medicine. It has helped thousands of individuals with ITP and other bleeding disorders to achieve a better quality of life and long and lasting results. Blood-SP should be taken regularly for one year and then as long as needed as a supportive food supplement. We use only the purest, superior quality ingredients in all of our products, including Blood+SP. Our products are free from common allergens, food colorings, preservatives, binders, and fillers including gluten, corn and dairy and they are fully in compliance with industry standards and guidelines for purity of foods and dietary supplements. Note: For people with ITP, Blood-SP should be used with Immune-SP for complete support.